Panels on oral history in the archive continued to discuss and debate the role of the archive in the collection, maintenance and dissemination of information and the challenges posed by these very categories. The third day of parallel sessions brought to the fore marginal voices, stories of people silenced, narratives and counter narratives. 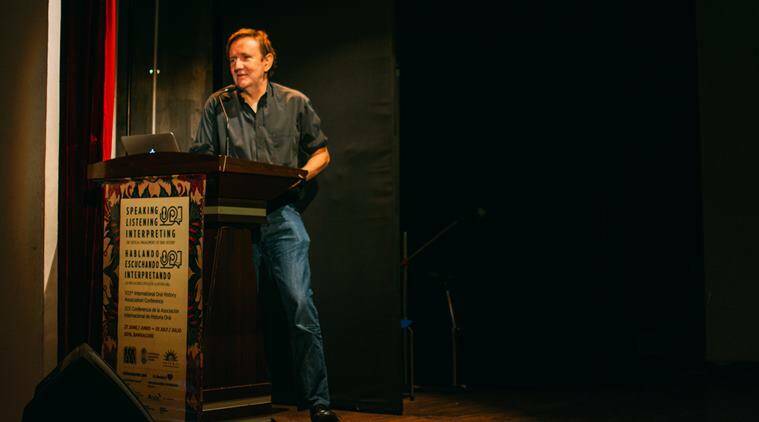 The ongoing International Oral History Conference at the Srishti Institute of Art, Design and Technology has been a polyphonic site of emergent discussions on the practice of oral history. Moushumi Bhowmick (India) of The Travelling Archive encapsulated her experience here as such “This Conference is a way to make a bit of sense of what I do and how my work can be part of a discipline”. The third day of parallel sessions brought to the fore marginal voices, stories of people silenced, narratives and counter narratives. Panels on oral history in the archive continued to discuss and debate the role of the archive in the collection, maintenance and dissemination of information and the challenges posed by these very categories. Other panels discussed oral histories of indigenous peoples and their experiences of colonization; oral history and the politics of identity; gender, sexuality and oral history; family histories, oral history accounts of Soviet and Post-Soviet Experiences; gender and identity; oral narratives and memory debates. A Spanish language panel on politics, resistance and oral history as well as a bilingual (English and Spanish) panel on place, migrancy and environment through oral history practice were also in session. Participants came from various countries to present their engagements and inquiries with oral history. Papers were presented from countries like Estonia, Iceland, Nigeria, Iran, Canada, Argentina, Belgium, Finland, Australia, Brazil, Cameroon, Pakistan and China. The Indian participants debated the nuances of marginalized voices through the varied lens of gender, sexuality, subaltern histories; and the narratives and counter-narratives that emerge out of the ‘voicing’ of such experiences. There were two thematic panels. The first on orality as a source of collective identity, memory and critical discourses, discussed the orality embedded in performance, with special reference to puppetry and how puppetry becomes a site for the convergence and speaking of subversive voices. The second thematic panel discussed the opportunities presented by oral histories to record and better understand the developments in recent science and how to take this understanding of scientific practice forward. Two film screenings were held: “A Historian of his Own Science” by Swati Dandekar (India) and “The Bond” by KP Jayasankar and Anjali Monteiro (India). Exhibitions and presentations included “Image-Memory-Voice: oral history and the photography collection of Sumitra Manandhar”, curated by Indira Chowdhury (India) and Nayantara Gurung Kakshapati (Nepal) and “Mapping Memory: The Bangalore Storyscapes Project”. A presentation on the latter was made by the curators- Indira Bharadwaj, Avehi Menon and Archit Guha. The second public panel titled “Shifting Perspectives: Oral history and the memory of disaster” at the National Centre for Biological Sciences (NCBS) was chaired by Dr Donald Ritchie (USA). Dr Ritchie described IOHA 2016 as “memorable”. He also laid the ground for the panel by highlighting how the histories and imaginations of disaster give rise to collective narratives and counter-narratives. Rama Lakshmi, of the ‘Remember Bhopal Museum’ project made an interesting point about the pressure on survivors of disasters to adhere to narratives “according to the national template”. She emphasized that in current times, the national template of India: as a country pushing for economic growth, creates space for a lot of counter-narratives because the survivors of the Bhopal gas tragedy disrupt this homogenized idea of economic prosperity. Rama Lakshmi’s talk also highlighted the Remember Bhopal Museum as a pro bono museum, which relies predominantly on oral history. Mark Cave discussed the ‘Ghosts of Katrina’ and gave insights into the politics of tourist economy of rebuilding New Orleans after Hurricane Katrina struck. Thomas Doig’s talk recounted the events of the 2014 Morwell fire in Australia. His impassioned address highlighted the social environmental disasters that present opportunities to generate new knowledge on climate change through the practice of oral history. From NCBS, IOHA 2016 shifted to the Royal Orchid Convention Centre, Bengaluru for an evening performance and presentation by Moushumi Bhowmick, singer, writer and collector of songs and audio. After the solemnity of the public panel discussion at NCBS, Moushumi’s mellifluous voice changed the tone of the evening. The participants of the Conference were mesmerized by her voice, which captured the emotions of belonging and about home. Moushumi also highlighted questions like: What is home? What was home? What could be home? How do we listen to border stories? How do we listen to a fence? These questions, along with Moushimi’s unforgettable songs, remained with the participants long after Day 3 of IOHA 2016 drew to a close with a grand dinner at the Convention Centre.